Aquaterra guide Sohan Singh Rana leading guests through a run of white water. A bend in the Ganges as it flows past the town of Tapoyan, eight kilometers upstream from Rishikesh. A beach along the Kaudiyala-Rishikesh stretch of the Ganges. 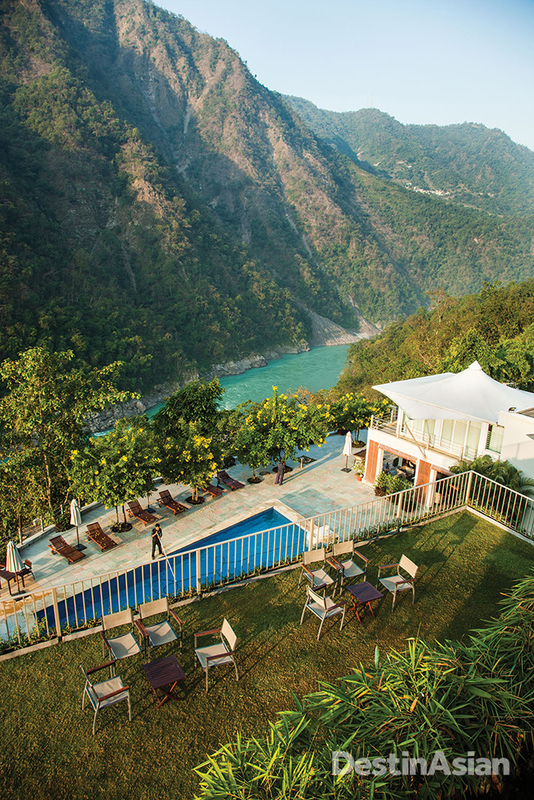 Terraced down a hillside above the Ganges, Atli Ganga features amenities such as a 14-meter swimming pool. 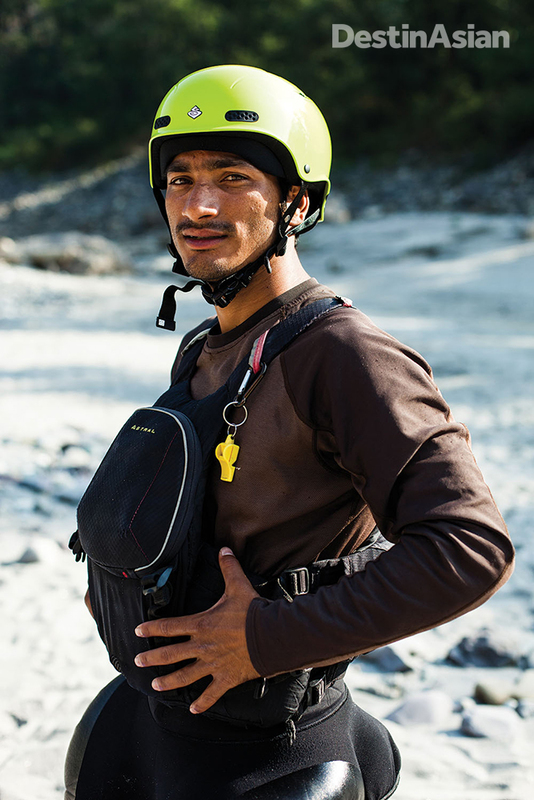 Aquaterra rafting guide Sohan Singh Rana. 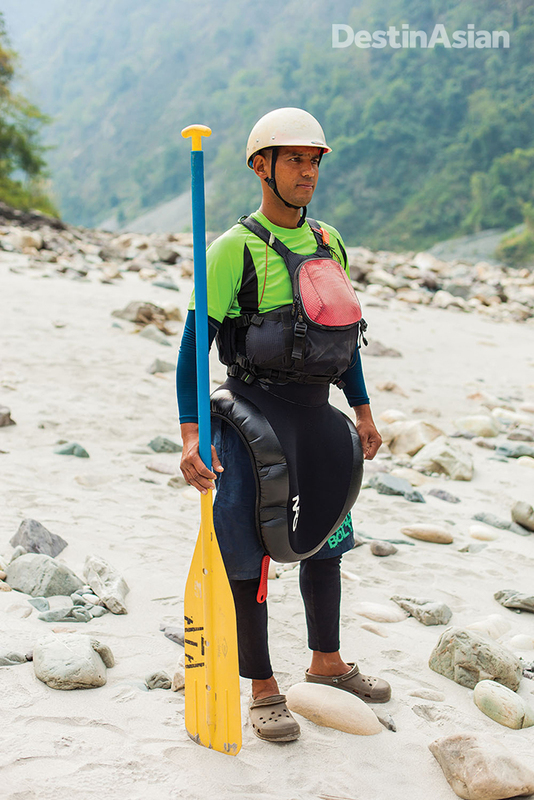 Aquaterra rafting guide Avval Singh Bhandari. A perfect stretch of rafting waters on the holy river. 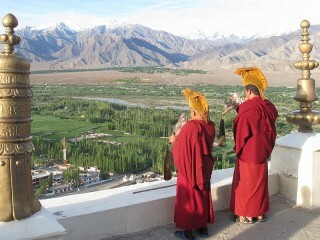 A new chapter in Indian ecotourism is unfolding along the upper reaches of the country’s holiest river, where a ban on rafting camps and the area’s first upscale wilderness resort are contributing to a greener ethos on the white water. 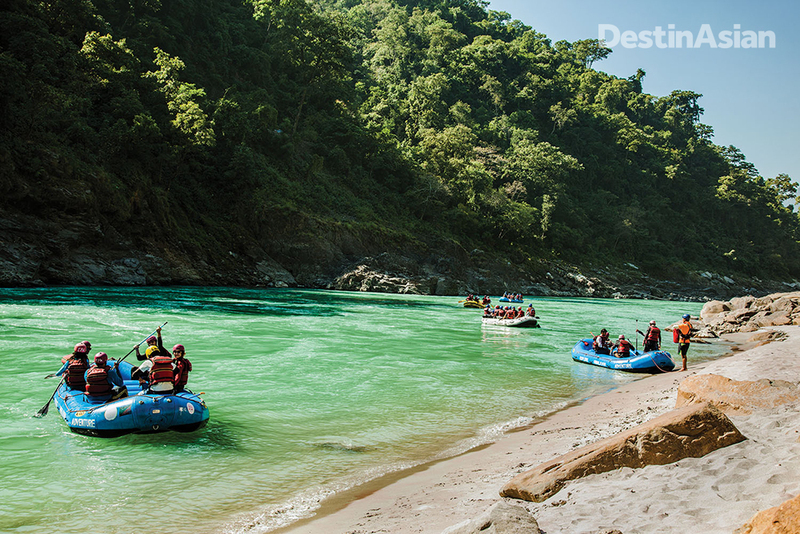 Midway through a float down the Ganges toward the Hindu pilgrimage town of Rishikesh, on a smooth, green stretch of river between the run’s most exciting patches of white water, our guide ships his paddle and declares recess. Within seconds, the rest of the eight-man crew—a bunch of young management trainees from India’s ITC Hotels group—is up and over the side of the raft and into the swift-flowing water for a holy dip. “You should have gone in,” one of the teenagers tells me later. “It’s the experience of a lifetime.” Then he confesses that he can’t swim. Over the last decade or so, as domestic tourism has exploded, India’s rapidly growing middle class has discovered the great outdoors. 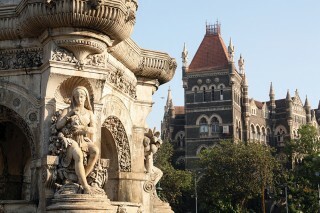 Figures from the World Travel & Tourism Council and the Adventure Tour Operators Association of India indicate that Indian tourists already account for more than 80 percent of the country’s travel business, with the number of local adventure travelers having more than quadrupled over the past five years, attracting outdoor-oriented companies ranging from Portland-based Columbia Sportswear to Seattle-based mountaineering firm Alpine Ascents to open branches here. But the outdoor industry is growing faster than environmental consciousness, and the typical weekender is a first-timer with a limited understanding of the impact that so-called “ecotourism” can have on the wilderness. The results threaten to be disastrous, environmentalists warn. “Self-regulation is not working, in any manner,” advocate Rahul Choudhary told me in the Delhi offices of the Legal Initiative for Forest & Environment (LIFE), a law firm that focuses on environmental cases. 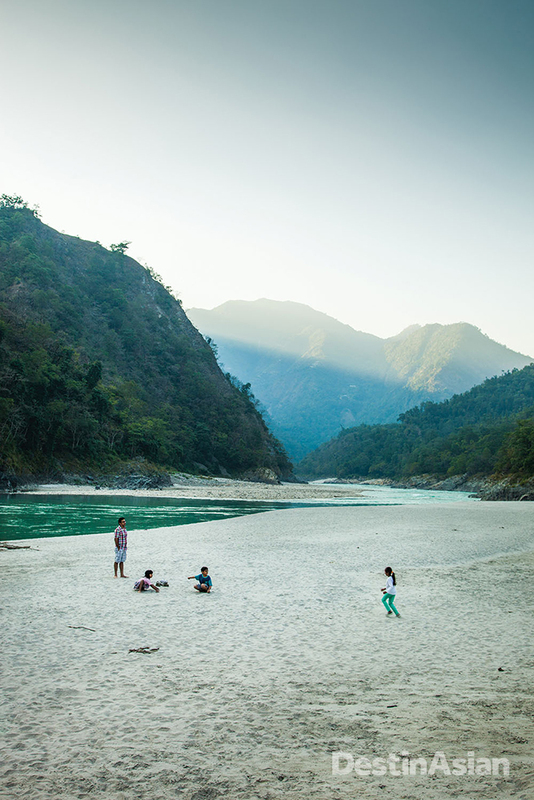 The first flashpoint has emerged here on the sacred Ganges, along a 36-kilometer section of river between Kaudiyala and Rishikesh that cuts through protected forest and features varying grades of rapids. 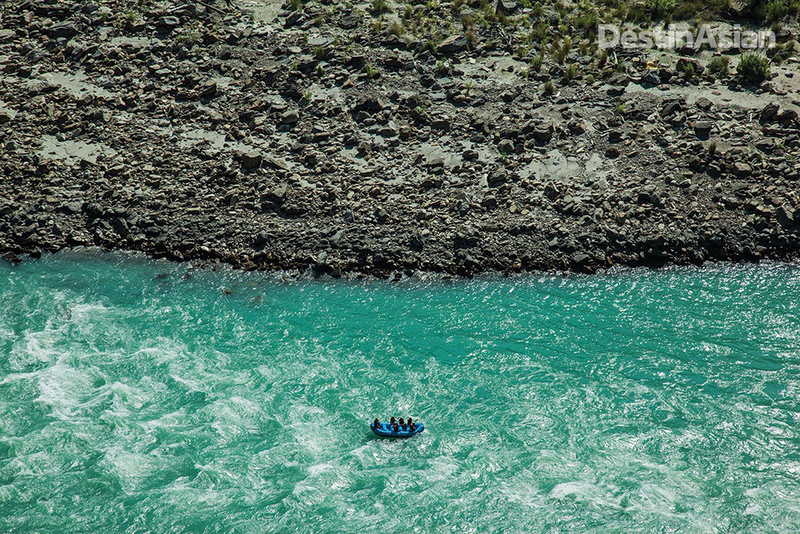 Since an Indo-German expedition down the Indus introduced white-water rafting to India in 1975, the sport has swiftly emerged as the most easily commercialized outdoor activity. 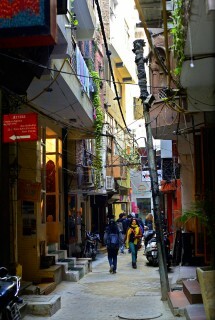 Rishikesh’s proximity to Delhi and its already established status as a tourist center has concentrated the boom here. According to a survey by the Forest Research Institute in nearby Dehradun, rafting camps along the river mushroomed from four in 1994 to nearly 100 by 2010. Despite rules that prohibit flush toilets, generators, electric lights, and disruptive activities, these camps have been great for business, but not so great for the foothills of the Garhwal Himalayas. All it takes to call yourself an outfitter is a business license. There are no park rangers to ensure that tourists and tour operators follow basic wilderness etiquette, so big loudspeakers blaring Bollywood tunes, whirling disco lights, thickets of discarded beer bottles, and even drownings became commonplace on this popular stretch of the Ganges, where until recently every patch of sand bristled with tents. 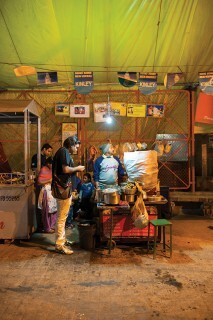 “It was like a slum had been set up there,” Choudhary said. Thankfully, that’s now set to be a thing of the past. Following petitions from a nonprofit environmental group called SAFE, or Social Action for Forest and Environment, and two similar organizations in early 2015, India’s National Green Tribunal ordered a stay on the issue of new camping permits last March and was considering a blanket ban of rafting between Kaudiyala and Rishikesh. In December, the tribunal banned all camping and the use of disposable plastic along this stretch of river, but stopped short of putting an end to rafting. 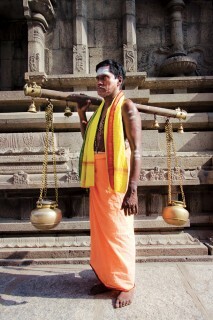 The conflict has pitted Hindu holy men and environmentalists against outfitters. 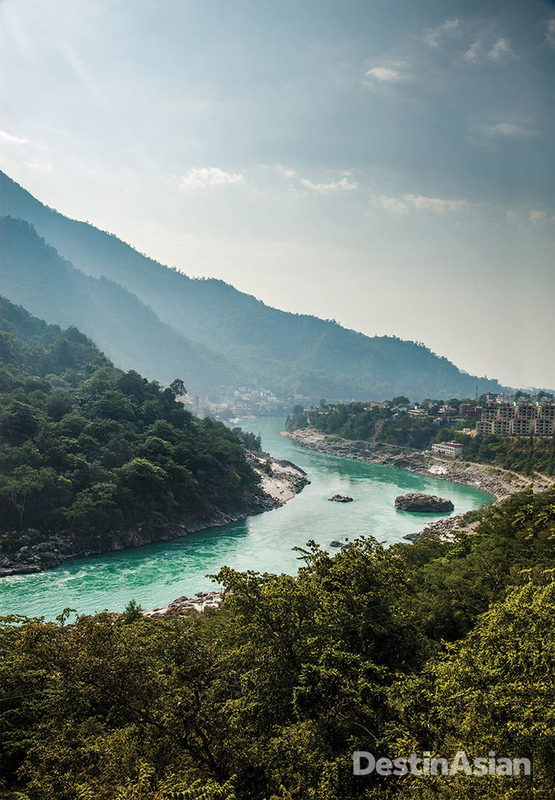 But after the dust settles, the river and the mountains could emerge as the winners, says Vaibhav Kala, who recently invested several hundred thousand dollars to build Atali Ganga, an upscale wilderness resort smack in the middle of the contested zone. 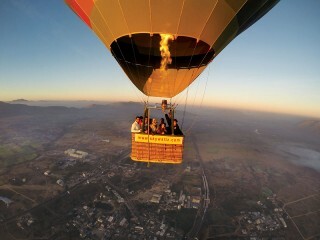 “This is going to be the defining discussion on how outdoor activities and events are conducted in India. We are hoping this will initiate an era of regulation in the outdoors,” Kala told me. Last September, I traveled to Rishikesh for the opening of the nine-month rafting season to see for myself how Kala is working to change the industry, even as he and a handful of serious outfitters battled against a complete ban on their bread-and-butter business in India’s foremost environmental court. Thanks to the stay on licenses there wasn’t a single beach camp on the river; on the water, it was like a trip back to the 1990s. But the congested nightmare of blaring horns and eye-watering pollution in Haridwar and Rishikesh made it clear that stopping Indians from enjoying the great outdoors won’t be enough to protect it. Although it goes against the wilderness ethos of roughing it, Kala believes the luxury services offered at Atali Ganga could be part of the answer. A burly, avuncular man who reminds me a bit of Balu, the cartoon bear from the old Disney version of The Jungle Book, Kala isn’t your typical hotelier. 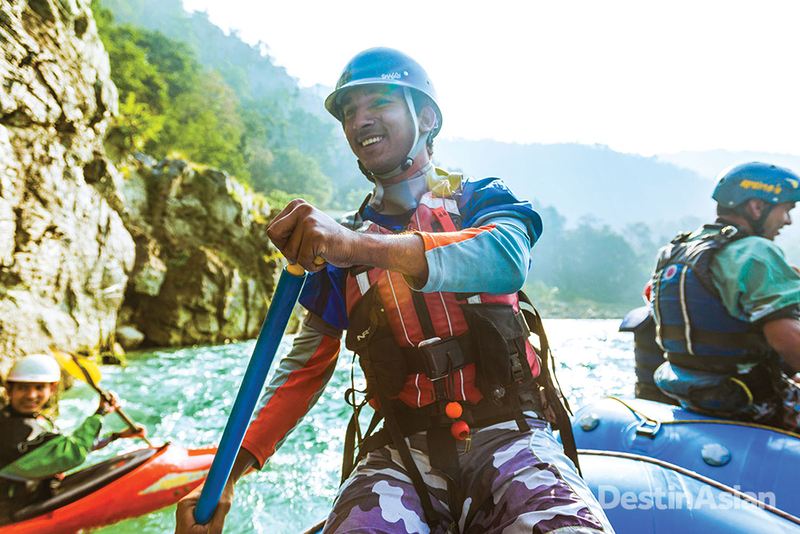 Over the past 20-odd years, his Delhi-based tour company Aquaterra Adventures has specialized in elite-level rafting expeditions on India’s toughest rivers, logging several first descents. 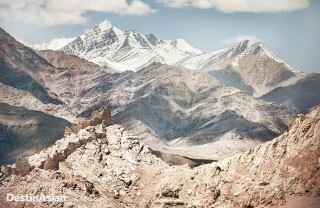 He’s also taken Indian adventurers up Kilimanjaro, down the Zambezi, and along the frozen Zanskar to the most isolated villages of high-altitude Ladakh. So what turned him from trail mix and sleeping bags to champagne and 400-thread-count sheets?